HOTROD Chassis rigidity is a factor in maintaining the tight body gaps expected today, so a really good X member is critical. (Photo courtesy Fatman Fabrications Inc.) Custom-fit chassis can be configured for budget-conscious builds, street/strip performance, or all-out handling performance. (Photo courtesy Chris Alston's Chassisworks) 52 n Performance & Hotrod Business n January 2015 Chassis Models Available What's available is pretty inclusive and ranges from a number of off-the-shelf, in- stock chassis made to fit specific models of cars and trucks starting from the '20s and going through to the current model year. They include not only GM, Ford and Chrysler chassis, but also classic European and Japanese cars and trucks. And while chassis for some models, such as the '55 Chevy, will always be in demand and avail- able from various sources, others might require more research. But there are also plenty of custom options; a few manufacturers stick to cus- tom-only projects; and others are in transi- tion. 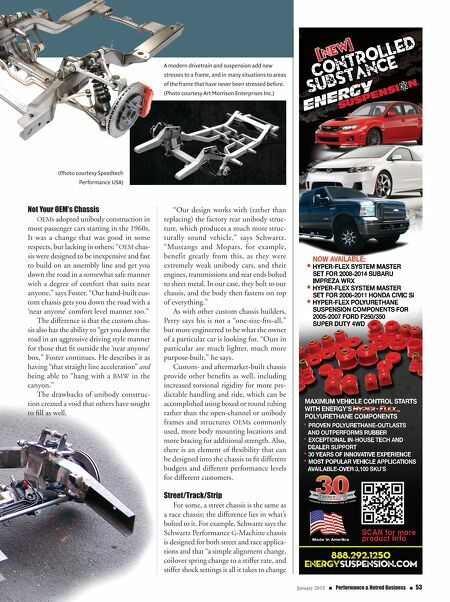 Blake Foster, Speedtech Performance, St. George, Utah, for example, says the company is in the process of developing chassis systems for the '55-6-7 Chevys, '64-'72 Chevelle A bodies, '67-'72 C10 trucks, and '58-'62 Impalas. Basically, he says the most popular items include "any- thing that is super-low, handles well and is easy to install." Others, such as Curt Perry, Chassis Engineering, Riviera Beach, Fla., say all of its chassis are purpose-built and made to order, and are mostly for drag racing or Pro-Touring projects. Dale Schwartz, Schwartz Performance, Woodstock, Ill., says the most popular models from his perspective are the uni- body Mopar B- and E-bodies. "Since our chassis requires no floorpan cutting, they're generally pretty simple to install, and have a lot to offer. These old Mopars were built on the cheap and were extremely weak in nature." Brent Vandervort, Fatman Fabrications Inc., Charlotte, N.C., says his company makes a total of 21 specific-fit chassis, "with all necessary body, bumper and engine mounts." Each of these chassis is designed for specific model applications and requires "little or no modifications. We can also build a more 'universal type' of chassis upon request, where the customer fits the car to the chassis," Vandervort says. Lino Chestang, Chris Alston's Chas- sisworks, Sacramento, Calif., says Chassis- works' offering includes "a highly-configu- rable selection of custom-fit chassis systems that can be built for just about any project." The company also manufactures a special- ized system for high-end, Pro-Touring muscle cars called gStreet, which are cur- rently available for first-generation Camaro and Mustangs, with additional platforms in development. Craig Morrison, Art Morrison Enter- prises Inc., Fife, Wash., says the company offers its line of GT Sport "bolt-on" chassis for first- and second-generation Camaro, as well as several other GM models from the '40s through the '70s, with the most popular now being Tri5 and '47-'53 truck chassis. 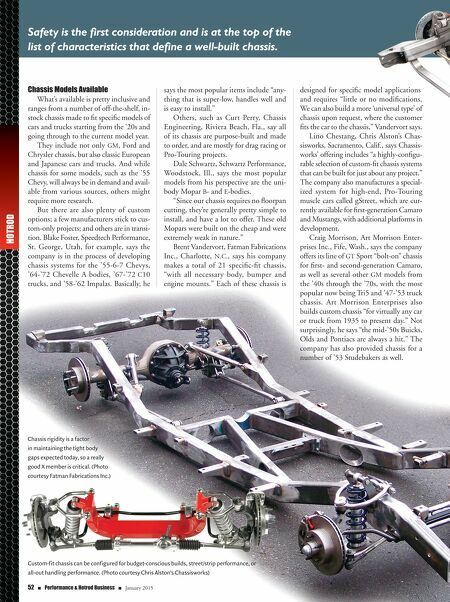 Art Morrison Enterprises also builds custom chassis "for virtually any car or truck from 1935 to present day." Not surprisingly, he says "the mid-'50s Buicks, Olds and Pontiacs are always a hit." The company has also provided chassis for a number of '53 Studebakers as well. Safety is the first consideration and is at the top of the list of characteristics that define a well-built chassis.